Equatorial Guinea’s (Republica de Guinea Ecuatorial) President Obiang Nguema Mbasogo expressed his disappointment at the recent criticism from some agencies about the creation of the UNESCO-Obiang prize during the opening ceremony of the 60th Session of the World Health Organization Regional Committee for Africa in Malabo. President Obiang stated that the prize would precisely enable UNESCO to invest more in research. President Obiang has stated in the past that the award was created with the goal of preserving human life. The significant funding allocated for this prize is in order for scientists to conduct studies and so they have the resources they need to find cures—for the health and well-being of people everywhere, including in Equatorial Guinea. Further, he said Equatorial Guinea is working both to improve itself and contribute to the international community—the UNESCO Prize is a part of this effort. During the opening ceremony of the WHO event, President Obiang also announced the donation of USD$1.5 million from the Government and people of Equatorial Guinea to the WHO, as well as the delivery of a headquarters facility for the organization to expand its work in the country. President Obiang explained that funding is to be directed for research undertaken by the organization for health of peoples worldwide. He also reminded participants at the event of the recently signed agreement with the African Union for the creation and installation of the first Headquarters of the African Center for Science, Technology and Innovation in Equatorial Guinea. The 60th Meeting of the WHO Regional Committee for Africa is taking place in Malabo and brings together health ministers from the 46 member states. The five-day meeting is attended by hundreds of participants, including senior WHO officials, representatives of United Nations Agencies, Funds, Programs as well as a number of bilateral, multilateral, inter-governmental and non-governmental organizations. The purpose of the meeting is to set policy and approve the budget and programs for the WHO in the region. Equatorial Guinea's (Republica de Guinea Ecuatorial) President Obiang Nguema Mbasogo made a donation of USD$1.5 million to the World Health Organization (WHO) to support research for global health. The announcement was made during the opening ceremony of the 60th Session of the WHO Regional Committee for Africa, which is taking place in Malabo. In his opening remarks, President Obiang welcomed the various delegations participating in the event and expressed his enthusiasm for hosting such an important meeting in Equatorial Guinea. He announced the donation of USD$1.5 million from the Government and people of Equatorial Guinea to the WHO, as well as the delivery of a headquarters facility for the organization to expand its work in the country. President Obiang explained that funding is to be directed for research undertaken by the organization for health of peoples worldwide. President Obiang also highlighted the various successful measures the government has taken to fight diseases that afflict Equatorial Guinea, such as onchocerciasis on the island of Bioko. He also mentioned the progress achieved through the malaria eradication program across the country. The Minister for Health and Social Welfare, Francisco Pascual Obama Asue stated that the health of mothers and children is still the most worrying health issue on the continent and summarized many of the actions taken by the government to boost health outcomes. The honorary Chairman of the Committee, former President of the Republic of Mali and former President of the African Union, Alpha Oumar Konare, called on Africa to take seriously the reality that African problems can only be solved by Africans and urged African Heads of State to promote human resources training in new technologies across all sectors. The event concluded with remarks from the Director General of WHO for Africa, Dr. Margaret Chan, where she welcomed the efforts made in Africa to reduce infant mortality and health successes achieved recently, but expressed that more needs to be done to ensure health stability and in the fight against HIV / AIDS. She acknowledged that women and children remain the most vulnerable group for these types of diseases. The 60th Meeting of the WHO Regional Committee for Africa is taking place at the Parliament of the Economic and Monetary Community of Central African States (CEMAC), located in Malabo and brings together health ministers from the 46 member states. The five-day meeting is attended by hundreds of participants, including senior WHO officials, representatives of United Nations Agencies, Funds, Programs as well as a number of bilateral, multilateral, inter-governmental and non-governmental organizations. The purpose of the meeting is to set policy and approve the budget and programs for the WHO in the region. 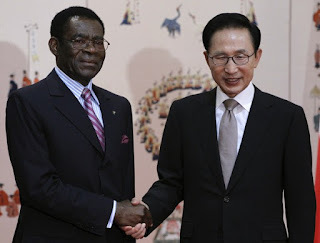 Equatorial Guinea's President Obiang Nguema Mbasogo, on his first trip to Korea since the two allies formed diplomatic ties three decades ago, has met with Korea's President Lee Myung-bak during a bilateral summit in Seoul, Korea. President Obiang said the agreements reached at the meetings in Korea will be of great benefit—technologically and economically—to both nations. Equatorial Guinea's (Republica de Guinea Ecuatorial) Minister of Agriculture and Forestry and National President of the Youth Federation of the Democratic Party of Equatorial Guinea (PDGE), Nguema Obiang Mangue, has been attending and supporting the women's soccer matches at the Singapore 2010 Youth Olympic Games in an effort to promote and support culture and sports in his country. Equatorial Guinea's women's soccer team had its latest victory over Iran, carrying them to the finals. The team has been unstoppable and has managed to keep a perfect score. The Equatoguinean delegation will face Chile tomorrow for a chance to win the tournament. Judit Ndong, the captain of the team, said she felt a lot of responsibility as she is leading not only her country, but also her continent. Minister Nguema Obiang Mangue is attending the soccer matches to support the hard work and outstanding performance of Equatorial Guinea's female soccer team at the Youth Olympic Games. The African news service News 24 today reported that a court in Equatorial Guinea has sentenced 11 people up to 21 years in prison for the embezzlement of almost euro 4 million worth of public funds. News 24 reported that defendants in the anti-corruption trial included a Member of the Parliament of Equatorial Guinea, as well employees of the Sociedad General de Banco en Guinea Ecuatorial (SGBGE) bank and the Finance Ministry of Equatorial Guinea. News 24 reports that the verdicts brought an end to the first anti-corruption trial of its size in Equatorial Guinea. The Republic of Equatorial Guinea (Republica de Guinea Ecuatorial) has sentenced five government officials from the Ministry of Finance and Budget for their involvement in a corruption scheme. The officials had been convicted on charges of embezzlement, forgery of official documents and misappropriation of funds. These judicial sentences are part of Equatorial Guinea's ongoing anti-corruption and governmental transparency initiative. Sentences were pronounced by the Court of Appeal of the Insular Region against former Finance Ministry officials on charges of embezzlement, forgery of official documents and misappropriation. The former officials had been accused by the Ministry of Finance and Budget of acting in complicity with employees of the bank Societe Generale Banks in Equatorial Guinea (SGBGE). The panel of the Court of Appeal consisted of the President of the Court of Appeal Bioco, Antonio Pascual Oko, Magistrate Adelaida Casana; Judge Antonio Ntutumu Afana and Secretary Metodio Esono Angong Andeme. To promote greater judicial transparency, relatives and friends of the accused, as well as members of the media and the general public were present at the Palace of Justice for the pronouncement of sentencing. The Court convicted Ernesto Abeso Onana and Adolfo Mba Ela for the crime of forgery of stamps. Each defendant was sentenced to two years and one day of imprisonment in a medium-security prison and fined one million Central African Francs (XAF). Ernesto Abeso Onana, Adolfo Mba Ela, Martin Nseng Monsuy, Angel Salvador Elo Micue and Astrina Micue Ndongo have been convicted of falsification of public documents and official trade. They have been sentenced to two years and one day to imprisonment in a medium-security facility and fined 2 million XAF. Ernesto Abeso Onana, Adolfo Mba Ela, Martin Nseng Monsuy, Angel Salvador Elo Micue were convicted of embezzlement. They have been sentenced to a term of 17 years, four months and one day of imprisonment in a maximum-security facility. Juan Nguema Ondo, Astrina Micue Ndong, Agustin Ndong Ndong Bibang, Sunday Oyecunle Ladele and Benjamin Obama Obono have been convicted of misappropriation and sentenced to 12 years imprisonment in a maximum-security facility. Yolanda Ncono Onana and Antonio Eko Owono Nchama were convicted as accessories and sentenced to one year and six months imprisonment in a minimum-security facility. The convicted perpetrators are also required to make restitution in the amount of 258,518,748 XAF. Equatorial Guinea's (Republica de Guinea Ecuatorial) Ministry of Health and Welfare and the Sanitary Prevention Department launched a cholera and measles vaccination campaign in an effort to further improve health services for the nation's citizens. Health centers in Malabo have expanded their immunization programs and launched a vaccination campaign for pregnant women and children up to 5 years of age. President Obiang Nguema Mbasogo said the vaccination campaign will improve the quality of health care and be of great benefit to the people of Equatorial Guinea. Another effort to improve the quality of life for children was the arrival of new UNICEF representative for Equatorial Guinea, Aboubacar Saibou. The State Secretary for International Cooperation, Victoriana Nchama Nsue Okomo, received his credentials during the meeting where he explained that UNICEF's plan of action is to work closely with the government to address child- and education-related issues. UNICEF Representative Aboubacar said: "Our goal in Equatorial Guinea is to support the government in reducing children issues and working on health and social protection areas to promote the rights of children and women and improve the quality of education. Our job is to take measures to protect children and women in the country." During the hearing, Aboubacar was accompanied by deputy Eduardo Rodriguez and UNICEF Information Officer Felipe Esono Croner. President Lee mentioned his expectation for Korean investments to move forward in Equatorial Guinea, while President Obiang asked Korean businesses to take advantage of the country's vast opportunities in natural resources, including oil, gas and agriculture. Equatorial Guinea's Minister of Agriculture and Forestry, Teodoro Nguema Obiang Mangue, and Minister of Foreign Affairs, Pastor Micha Ondo Bile, also participated in the summit. The leaders of Equatorial Guinea and Korea also agreed to cooperate in infrastructure and energy development projects, which will help to diversify Equatorial Guinea's industries for its citizens. The two leaders intend to "promote bilateral exchanges in technologies and human resources to foster closer economic ties," according to the Korea Times. 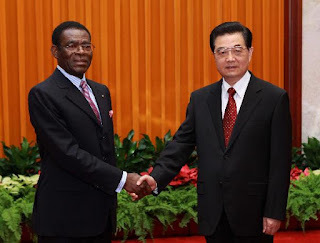 President Lee praised Equatorial Guinea's efforts towards its social, economic and infrastructure plans. The leaders discussed how Korea's development experience can help Equatorial Guinea with its "Horizon 2020" development plan to help the African nation with its education and construction of infrastructure efforts. During President Obiang's four-day stay, he is scheduled to visit Korea's energy facilities before departing to China. As part of Equatorial Guinea's (Republica de Guinea Ecuatorial) efforts to advance its relations with the international community, President Obiang Nguema Mbasogo is making an official visit to Korea. President Obiang will meet with President Lee Myung-bak for a summit to support cooperation efforts in the energy and infrastructure construction areas, reported a Korean official. This is President Obiang's first visit to Korea since the two countries established diplomatic ties in 1979. As part of a broader effort by the government of Equatorial Guinea to improve the country's infrastructure for its citizens, President Obiang and President Lee will meet to coordinate efforts on different sectors such as gas, petroleum, energy and infrastructure. The presidents will also talk about how Korea's development experience can help Equatorial Guinea with its "Horizon 2020" development plan. Equatorial Guinea has done considerable work toward upgrading and enhancing the country's infrastructure, such as investing in a new network system for sewage and wastewater treatment and rainwater drainage in the city of Malabo. Equatorial Guinea (Republica de Guinea Ecuatorial) and the Global Viral Forecasting Initiative along with several Central African States have partnered with the Economic Community of Central African States (ECCAS) to form a network to fight H1N1 and HIV. The purpose of the network’s recent forum was to share knowledge and best practices, and to collect data and prevention procedures among military health professionals in the region. The network stressed the importance of fighting pandemics and to develop strategies based on principles of international collaboration. The Ministries of Defense of each member state selected a representative to represent the state and liaise on related issues with other countries in the network. Further and in coordination with GVFI, each and every defense force within the network is responsible for the gathering information and experiences on the prevention of infectious diseases. As part of a broader effort by the government of Equatorial Guinea to improve public health for its citizens, the country’s Prime Minister, Ignacio Milam Tang, met with members of the government to discuss preparations for the upcoming Sixtieth Session of the Regional Committee of the World Health Organization (WHO) for Africa, which is scheduled to take place in Malabo, Equatorial Guinea for the first time from August 30 to September 3. Representatives from the country’s Ministries of Health and Social Welfare, Interior and Local Corporations and Transportation, Technology, Post and Telecommunications will attend the WHO Regional Committee. The event is expected to gather 45 health ministers from various African nations, as well as members and staff of the WHO. The meetings will address HIV/AIDS prevention, malaria, alcohol abuse reduction, primary health care of mother and child, and the fight against tuberculosis and other tropical diseases. The educational system in Equatorial Guinea (Republica de Guinea Ecuatorial) has undergone many changes and overcome significant challenges over the years, and today the government is making strides in the promotion of education and professional training at all levels and for all age groups. From the promotion of compulsory education to advanced studies, the Government of Equatorial Guinea is making education a top priority as part of its Horizon 2020 development plan. "The education system in the country is funded by the state," said Mr. Secundino Evono Avomo, Equatorial Guinea's Vice Minister of Education, Science and Sports. "Oil resources are devoted to this sector and large quantities of those resources have been allocated to education investments such as the national university and the construction of educational facilities. There are resources set aside for future generations besides what is being invested now. If you had the opportunity to travel around the country, you could really see what is being done in the education sector." Vice Minister Evono Avomo recognized that President Obiang has made education a priority and that investment in education is essential because an "educated country is a developed country." In comparison to its African neighbors, the Minister highlighted that the "country under the current administration, has made great strides in recuperating what had been lost under the previous regime in all aspects, not only in education." Equatorial Guinea has "witnessed advances in a short amount of time that other countries have taken years to accomplish." He explained that every town council in Equatorial Guinea – consisting of approximately 1,400 people – has at least one or two schools and every man, woman and child has access to education. Urban areas, such as the large cities of Malabo and Bata, have multiple schools, both public and private, for all education levels. Equatorial Guinea's citizens have access to education from childhood; it is mostly free because the government, by law, provides for primary education, secondary is provided at low cost and university-level education only requires a minor tuition. As part of Equatorial Guinea's commitment to compulsory education and to meet the goals of the Horizon 2020 plan, Vice Minister Evono Avomo acknowledged that there will be challenges ahead and that greater attention is being paid today to the development of technical training programs for those who do not want to pursue university and professional studies. 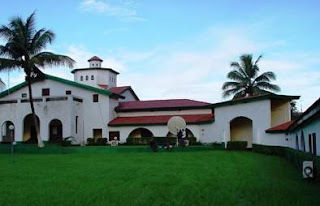 The National University of Equatorial Guinea (UNGE) was founded in 1995 as the first national university, which has graduated well over 13,000 students in various professions. The government is making investments to further expand the size of the university campus, and numerous programs, including subsidized dormitories and improvements in social science, education, science curriculums, and international study abroad programs. Equatorial Guinea's government has also, in partnership with Amerada Hess, established a $40 million education program through which primary school teachers participate in a training program to ensure they have an understanding of the most modern techniques relating to child development. The government also continues to partner with foreign oil companies to undertake a multimillion dollar school renovation program and continues to work with foreign countries to reform outdated curriculum materials. The National Library of Equatorial Guinea is sponsoring a national literary contest, the Obiang Nguema Mbasogo Literary Award, in which all Equatorial Guinean citizens, both students and adults can participate. This annual contest is aimed at promoting culture and raising the level of literacy in the society. At the student level, the literary contest requires contestants to produce a novel that reflects situations inspired by topics pertaining to culture, family disruption, moral values, education, etc. At the adult level, the contestants can write either an essay or an abstract novel on any topic of choice. The entries will be submitted in August to the National Library of Equatorial Guinea, located in Malabo. The winners will be announced by local and international media. For students, the first prize is a full scholarship to a four-year college in the U.S. with all expenses paid and the publication of the literary work. The second place prize is 500,000 CFAS (~ USD $1,000), and third is 300,000 CFAS (~ USD $500) and the publication of the novel. The first place adult winners will receive one million CFAS (~ USD $2,000) prize, second place 500,000 CFAS (~USD $1000) and third place 300,000 CFAS (~ USD $500) with a publication of the work as well. The National Library of Equatorial Guinea opened last year and was sponsored by the government. The National Library will lead other initiatives and contests to promote culture and education in Equatorial Guinea. These programs include contests in painting, story telling, short films, children's programs, the creation of a theatre company in Equatorial Guinea, the acquisition of mobile libraries to distribute texts and boost literacy, and construction of newsstands for easier accessibility in all regions across the country.